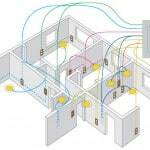 Having a map of your home’s electrical circuits can help you identify the source of a problem. Electricity travels in a circle. It moves along a “hot” wire toward a light or receptacle, supplies energy to the device (called a load), and then returns along the “neutral” wire (so-called because under normal conditions it’s maintained at 0 volts, or what is referred to as ground potential) to the source. This complete path is a circuit. In house wiring, a circuit usually indicates a group of lights or receptacles connected along such a path. Each circuit can be traced from its beginning in the service panel or subpanel through various receptacles, fixtures, and/or appliances and back. Inside your service panel, you may discover that an electrician or previous homeowner has notated which circuit breakers or fuses control which circuits. If your panel doesn’t contain such a reference, it’s a good idea to map your circuits so that when the need arises you can quickly find the right circuit breakers or fuses to shut off or reset. Though the following instructions refer to circuit breakers, the same procedure applies to panels that utilize fuses. If the circuit breakers aren’t already numbered inside the electrical panel, number them. Make a list that you can post on the inside of the door. Numbers should correspond to each circuit breaker. After each number, note which devices the breaker controls. Individual circuit breakers control each circuit. Mapping your circuits is something you should do in daylight with a helper. 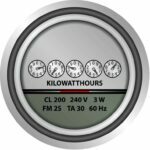 Be aware that all of your home’s power will be off at some point in time, so when you’re done you’ll have to reset clocks, timers, and the like. 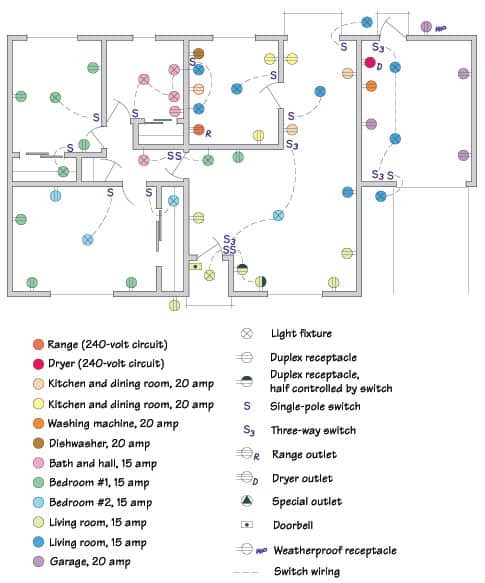 To make your mapping easier, remember that receptacles are usually on circuits separate from lighting, and major appliances such as furnaces, microwaves, washing machines, electric dryers, and electric ovens often have dedicated circuits. Note: If your electrical panel has old circuit breakers, flipping them off and on can break them, and obsolete circuit breakers may be difficult to replace. 1At the electrical panel, turn off all of the circuit breakers. 2Identify any large, double (240-volt) circuit breakers first. Flip one on. 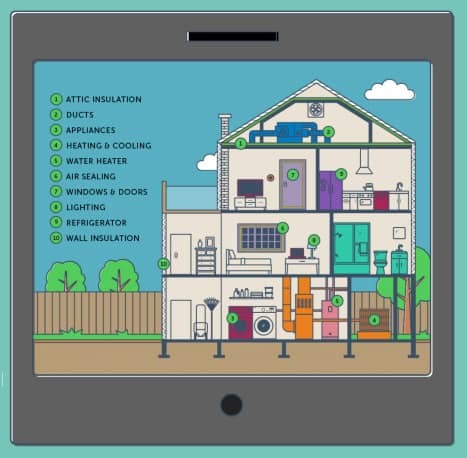 Determine which major electrical appliance(s) it supplies by turning on each electrical appliance (don’t forget equipment such as the furnace and the pool pump) until you find the right one(s). Repeat with the other large circuit breakers and major appliances. 3Have your helper plug a small lamp (or any small electrical device) into a standard room receptacle. Turn breakers on and off until you find the one that turns on the device. Leave that breaker on and have your helper plug the device into other receptacles; note all the ones controlled by that breaker. 4Repeat this process, switching on room lights one by one, and note the circuit breaker that controls each set of lights.